This post is inspired by Joost van der Westhuizen, who died earlier this month after a long battle with motor neuron disease. Joost was arguably the greatest ever scrum half, and was a key member of the 1995 world cup winning Springbok team. The 1995 Rugby World Cup unified South Africans as they had never been before. The World Cup symbolised more than a sporting event – it became a symbol of hope an inspiration for the Nation. I can still remember where I was when we watched the final, and the exuberance in the streets as we drove home afterwards. Joost’s death has brought back those memories strongly and he will always be remembered with fondness. Yet, the 1995 World Cup was never meant to be won by South Africa. We went into the tournament as rank outsiders. We had only recenlty returned to international rugby, after years in isolation. We had lost heavily to both New Zealand and Australia in the years leading into the World Cup, and these two teams were the favourites. In our first pool match, against defending champions Australia, Pieter Hendricks ran around David Campese to win the game for the ‘Boks. South Africa began to believe! We won the “Battle of Boet Erasmus” – an ill tempered affair against Canada that saw several players being sent off for fighting. We survived a brutal quarter final against Samoa that saw several key players, including Joost, come away with injuries that should have sent them home for the rest of the tournament. They played on. We survived the floods in Durban to hold out France by a whisker in the semi final. In the other semifinal, All Black superstar Jonah Lomu had steamrollered Mike Catt, and the rest of the England team to ensure the favourites their place in the final. 24 June 1995 dawned dry and sunny in Johannesburg. All over the country South African met up with friends and family to watch the game. This was not a game to watch alone at home. Somehow we knew that this day was going to be special. The final itself was a tight affair. No tries were scored and it was eventually won in extra time with Joel Stranskie’s famous drop goal. We had won in spite of the odds. What lessons can we take from that team and apply to delivering a winning data culture? As stated earlier, the Springboks were not the favourites to win the tournament. They were neither the most skillful team, not were they the most experienced. In my opinion, four factors stood out, and can be applied to deliver a winning data culture in your business. 1. Discipline. The 1995 Rugby World Cup final was a low scoring affair. South Africans will believe to this day that Reuben Kruger – another great who is no longer with us – scored a try, but the referee did not see the grounding and we had no television ref in those days. Ultimately, both teams ground out their points from penalties and drop goals. Discipline was essential. Similarly, winning data cultures are built on a foundation of discipline. We need to understand and communicate our data policies and standards to all stakeholders. Good governance must drive the data behaviour that we need to meet our business goals. 2. Fitness. The Springboks may not have been the most skillful team, but coach Kitch Christie made sure that they were one of the fittest. At altitude – Johannesburg lies 1,753 meters (5,751 ft) above sea level – the ‘Boks’ defensive effort on the day was unwavering. Similarly, our data must be fit for purpose. Poor quality data cannot deliver quality insights. Business and IT must work together o agree and deliver minimum standards for data – to ensure that it can be trusted. 3. Teamwork. The biggest question going into the world cup final? Who would tackle New Zealand’s wunderkind – massive Tongan wing Jonah Lomu. Jost’s try saving tackle on Jonah is remembered fondly, but every member of the team tackled like demons for the entire match. The cover defense was outstanding. Winning with data requires a team effort – every knowledge worker engaging and delivering towards a common purpose. The days of IT being the custodians of data are over. In the modern, data-centric enterprise everyone is a data steward. The team is only as strong as its weakest link. 4. Leadership. The 1995 World Cup will always be remembered for the Madiba factor. President Mandela’s inspirational leadership was certainly contributed to teh support that the ‘Boks received, and must have inspired them tremendously. But the ‘Boks leadership was not limited to Mandela. 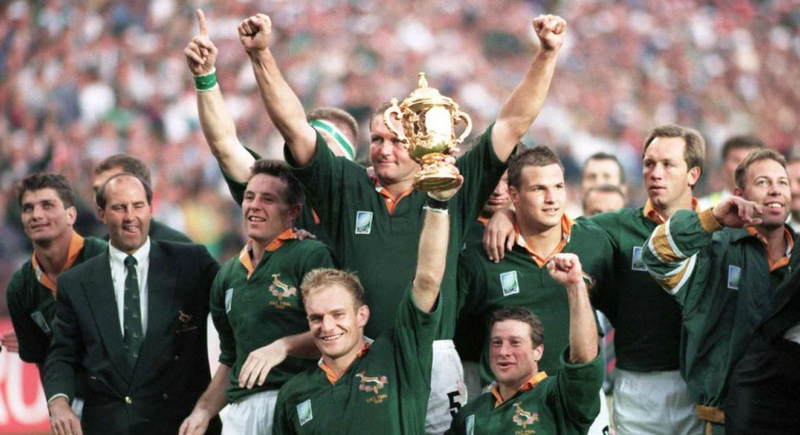 Coach Kitch Christie, captain Francois Pienaar, manager Morné du Plessis – these men and others ensured common purpose and a shared culture at various levels. In business, as in life, executive support is not enough. A winning data culture requires commitment at various levels of management. Coach Kictch Christie spoke of vision, ability, self awareness and the desire to improve, along with discipline and man management as the keys to greatness. He was explaining his coaching philosophy, of course, but his words apply to the data team. These factors require strong leadership and engagement – both at an executive level but also in the trenches. A winning data culture means that every leader in the business is looking for opportunities to improve data, every knowledge worker understands the impact of poor data quality and is striving for quality, that good behaviour is recognised and rewarded, and that unwanted behaviour is identified and managed out. Idealistic? Sure – but absolutely possible to achieve. Are there additional factors that you would add to the list?